Wind Art "Unique Garden Art"
items are wonderful pieces of garden art. There are many different shapes, colors, and textures. I like kinds of art. Some Wind Art has been around for a really long time, for example, the windchimes. In earlier times they were used to scare away birds and evil spirits. Later the they were hung in temples, palaces, and homes to bring good luck. The sounds that a windchime makes is determined by the length, width, thickness, and material of the tubes. They can be made from materials other than metal or wood. Some of the other materials are, glass, bamboo, shell, clay, and porcelain. I have made recycled wind chimes using silverware, cookie cutters, and computer disks. Try making one using your recycled materials. When sitting in the garden , the music of the chimes will take you to a very restful and stress free place. Close your eyes and let yourself drift away. Even during a storm, when the wind is blowing strong, I can sit in my living room and hear the beautiful music outside. I have a bit of trivia for you. I read that the Japanese game "Pokeman" was influenced by windchimes to create the character, Chimeko. How 'bout that? 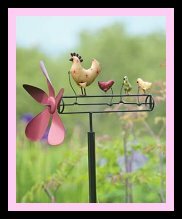 If you don't have any wind-art in your garden, you definitly need to add a windchime to your collection of garden art goodies. You will be so glad that you did. In America, during the 19th century, all toys that depended on the wind for movement was called a "Whirligig". This included pinwheels. They kept the kiddos amused for hours. These wind art toys were once used in gardens to scare off birds and squirrels. **So,Make sure that you don't put them around your birdfeeders, birdhouses or birdbaths. **You may want to use them around your fruits and your vegtables, though. Not only were the wind art toys decorative, but they also kept the flies and other pesky flying bugs away from outdoor meals and activities. The birds and flies seem to become alarmed with the fast movement of the whirling top. This piece of "wind art" is a very simple child's toy. Originally, it was made from paper. Then, as time went on, it was made from plastic, then, attached in the middle to a stick pin. It is made to spin around and around when blown upon by a person or the wind. These handpainted, wind art is brightly colored, "Old-Fashioned Pinwheels", come in a set of 3. Set them in your garden or along a walkway, and watch them spin in the breeze. Installed height is approximately 24". The 8" wide, steel pinwheels, are attached to sturdy steel stakes, and will gently age to a rusted patina. They will add an accent of color and motion to your garden beds or borders. Each one spins easily in the breeze. Pointed ground stakes plant easily. They are Gardener's Supply Exclusive. If you would like to own a set of these nostalgic items, just click on the picture and you will go directly to their website. You will love them. I know that when I saw the pinwheels for the first time, I had to get a few sets. A couple for gifts and of course a set for me. A "Whirligig" is another member of the "Wind Art" Family. It usually has one or more moving parts. It has many names, for example they have been called buzzers, comic weathervanes, gee-haws, spinners, whirlijig, whirlyjig, whirlybird, or just plain whirly. Most of the time it takes wind to make them spin, but they have been made to use hand, friction, or even a motor. Button, Friction, String, and Wind Driver are the four catagories that whirligigs can be placed in, but I am only interested in the "wind driven" kind. After all, I am talking about "Wind Art". 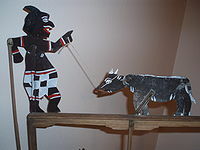 **"Indian Pulling Bull" undated** The shaft turns the Indian's arm, which makes the Indian pull the string, which lifts the bulls head. On the whirligig, the wind powers a simple or sometimes complicated device that causes repetitive motions and/or creates sounds. As I said earlier, the simplest and most common whirligig is the "Pinwheel". The pinwheel has a large cupped surface area which lets it reach its highest speed , very quickly, with very little wind. So, if the blades are larger, then there is more surface area for the wind to make contact with. This causes the whirligig to reach its maximum speed in even less time. If the blades are short and thin, then the wind must be stronger for the whirligig to operate. They come in many sizes and shapes. They are a fasinating piece of wind art. Whirligig comes from two words "whirlen" (to whirl) and "gigg" (top) or to whirl a top. Where these toys actually came from is not really known, but it would have been "technically" possible to make by 700 AD, when the Sasanian Empire began using windmills. The whirligig that we know today probably came over with the immigrants from the UK, it is mentioned in ealy American colonel times. How it has changed throughout time is not known, but at the end of the 19th century, building wind driven whirligigs had become an art form. They bacame very popular. The whirligigs were out in the weather year round, therefore, not many survived. 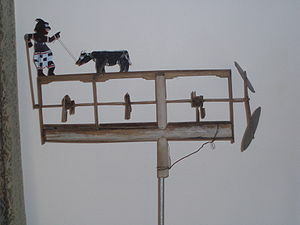 After 1900, the craftsmen from the southern Appalachians were the main producers of whirligigs. During the Great Depression there was an increase in production. This seemed to have been caused by the need for money. The whirligig was an art form years ago and even more so today. There are museums that have collections of nothing but whirligigs. They are considered Folk Art. In 1998, a 19th century Uncle Sam with a saw and flag, in excellent condition went for $12,650.00. At an auction in 2000 on sold for $10,925.00. The price has gone down since then. There have been many good whirligig craftsmen, The most well known is Vollis Simpson. There is a Whirligig Festival in Wilson, North Carolina and during the festival they have a whirligig building contest. The judge is Mr. Simpson. The wooden version can still be found, mainly in towns along the Appalacian Mountains. It's possible to even find them in some of the more traditional patterns. Of course I'm not planning a trip to the mountains and your probably not either, so I have included pictures from my friends at www.garden.com and www.gardenerssupply.com. Please check them out and GET YA' ONE ! 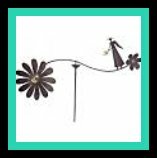 Nowadays, it's easy to find the whirligig that is right for you and that will fit into your garden just perfectly.